Remnants of the Ming dynasty ruled southern China until 1662, and Taiwan until 1683 a dynastic period which is known as the Southern Ming. The Ming dynasty was the family of emperors who led China from AD 1368 to 1644. The name is also used to talk about the Ming Empire that they led and the 276 years in Chinese history that it lasted. It is also famous for its pottery from Jingdezhen in Jiangxi and Dehua in Fujian. The Ming dynasty is known in Chinese as the Míng. This is written as 明 in Chinese characters. The character is a sun (日) and a moon (月) together and means "bright". Chinese uses different words to talk about the different meanings of a Chinese "dynasty" in English: their government is called the Míng cháo (大明帝國 or 大明帝国), and their time in Chinese history is called the Míng dài (明代). Unlike in English, the name of the dynasty is not the same as the family name of the leaders. The family that led China during the Ming were the Zhūs. This is written as 朱 in Chinese characters. Today, it's just a common Chinese family name, but it used to mean the kind of red coloring that you could make from cinnabar (HgS). The Yuan dynasty before them had been part of the Mongol Empire started by Genghis Khan. Its emperors had been Mongolian people, but most of China was Han Chinese. To keep their power, the Yuan used a Chinese kind of government of Three Departments and Six Ministries, with imperial examinations. Their laws gave special powers to Mongolian people, though, with other people from other countries ("Semu") placed second, northern Chinese third, and southern Chinese last. They were especially nice to Tibetan Buddhists and gave many important jobs to Muslims, although they also made Muslims break some rules and eat like Mongolians. Some Muslims were angry and started to fight the Yuan. Many people began to fight after the 1340s. The Black Death killed many people and the government did not keep up the work needed to stop the Yellow River from killing people when it flooded. The Red Turbans began fighting in 1351 and its best leader Zhu Yuanzhang made the Yuan emperor Toghun Temür run away from the capital city Khanbaliq (now inside Beijing) in 1368. When Zhu Yuanzhang took Khanbaliq, he said that the Yuan was over and that his family would be a new dynasty called the Ming. 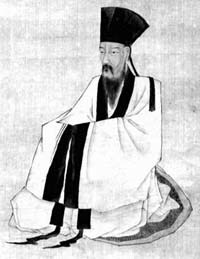 He said that 1368 was the 1st year of the Hongwu Era and became known as the Hongwu Emperor. Toghun Temür and other Mongolians still fought him, but now they were known as the Northern Yuan and the Ming became the real government of most of China. The Hongwu Emperor had many sons and made them the leaders of the 13 different parts of China. He did not stay in Khanbaliq. He made his old base Yingtian (today's Nanjing) into the new capital city. He wanted China to be more traditional and more Chinese, so he ended most government support for other religions and made Christianity against the law. He wanted China to take care of itself, so he ended most buying and selling of things from other countries. 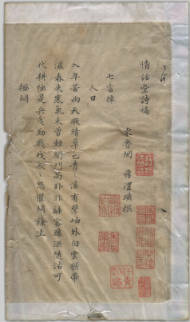 He made a list of rules for his family, and they mostly followed them during the rest of the Ming. The oldest son of the Hongwu Emperor died before him, so the next emperor was his grandson the Jianwen Emperor. The Jianwen Emperor was about 20 years old and didn't like the power of his many uncles. He started taking away their power, sending them away, or even making them kill themselves. The uncle leading Beiping (old Khanbaliq and now Beijing) was named Zhu Di. He pretended to be crazy so that the Jianwen Emperor would be less afraid. The emperor even let his three sons—kept in the capital city to be sure of their father's good behavior—go north see him. 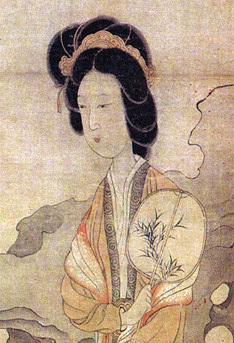 Zhu Di then began a war against his nephew. At first, Zhu Di said his war was only against the "bad helpers" who told his nephew to hurt their family. When his war was successful and he took Yingtian (now Nanjing), he made himself the Yongle Emperor. He said that his nephew had never been the real emperor and killed many people in the old government. He did not trust the people in Yingtian, so he made Beiping the main capital city. The southern capital then became known as Nanjing and the northern capital Beijing, the names they continue to use today. In Beijing, he built a new home which became the Forbidden City. The Yongle Emperor did not like many of the people in government who got there by doing well on their tests. He gave more power to eunuchs, men who were hurt as children to stop them from being able to have children of their own. One of these was Zheng He, a Muslim who led great treasure ships south from Suzhou and Nanjing in 7 big trips between 1405 and 1433. The first trips may have been looking for the Jianwen Emperor, but they also became trips that taught China about the South China Sea and Indian Ocean and opened up more buying and selling between their countries and China. The Mings' main capital of Beijing fell in 1644 to a rebellion led by Li Zicheng, who established the Shun dynasty. This was soon replaced by the Manchu-led Qing dynasty. The people who still liked the Ming continued to fight as the Southern Ming up to 1683. The Ming Empire has been described as "one of the greatest eras of orderly government and social stability in human history". It was the last Chinese dynasty led by the Han Chinese, not counting the short-lived governments of Li Zicheng and Yuan Shikai. It is also famous for its pottery from Jingdezhen in Jiangxi and Dehua in Fujian. A Bengali envoys presented a tribute giraffe in the name of King Saif Al-Din Hamzah Shah of Bengal (r. 1410–12) to the Yongle Emperor of Ming China (r. 1402–24). Shanhaiguan along the Great Wall, the gate where the Manchus were repeatedly repelled before being finally let through by Wu Sangui in 1644. A portrait of Jiang Shunfu, an official under the Hongzhi Emperor, now in the Nanjing Museum. The decoration of two cranes on his chest is a "rank badge" that indicates he was a civil official of the first rank. Painting of flowers, a butterfly, and rock sculpture by Chen Hongshou (1598–1652); small leaf album paintings like this one first became popular in the Song dynasty. Ming dynasty Xuande mark and period (1426–35) imperial blue and white vase. Metropolitan Museum of Art, New York. Chinese glazed stoneware statue of a Daoist deity, from the Ming dynasty, 16th century. A Ming dynasty print drawing of Confucius on his way to the Zhou dynasty capital of Luoyang. A Ming dynasty red lacquer box with intricate carving of people in the countryside, surrounded by a floral border design. Emperor Minghuang's Journey to Sichuan, a Ming dynasty painting after Qiu Ying (1494–1552). A 24-point compass chart employed by Zheng He during his explorations. The Great Wall of China: Although the rammed earth walls of the ancient Warring States were combined into a unified wall under the Qin and Han dynasties, the vast majority of the brick and stone Great Wall seen today is a product of the Ming dynasty. Spring morning in a Han palace, by Qiu Ying (1494–1552); excessive luxury and decadence marked the late Ming period, spurred by the enormous state bullion of incoming silver and by private transactions involving silver. The Forbidden City, the official imperial household of the Ming and Qing dynasties from 1420 until 1924, when the Republic of China evicted Puyi from the Inner Court. Lofty Mount Lu, by Shen Zhou, 1467. The puddling process of smelting iron ore to make pig iron and then wrought iron, with the right illustration displaying men working a blast furnace, from the Tiangong Kaiwu encyclopedia, 1637. Map of the known world by Zheng He: India at the top, Ceylon at the upper right and East Africa along the bottom. Sailing directions and distances are marked using zhenlu (Chinese: 針路) or compass route. Appreciating Plums, by Chen Hongshou (1598–1652) showing a lady holding an oval fan while enjoying the beauty of the plum. Ming dynasty Facts for Kids. Kiddle Encyclopedia. This page was last modified on 13 April 2019, at 02:30.